One day I will drive over these bridges, as I have before. I will find my nerve again or possibly a wing man. Or the teen will learn to drive, whichever comes first. Perhaps I've reached the point where it can't all depend on me, I need to able to say okay you can drive now. 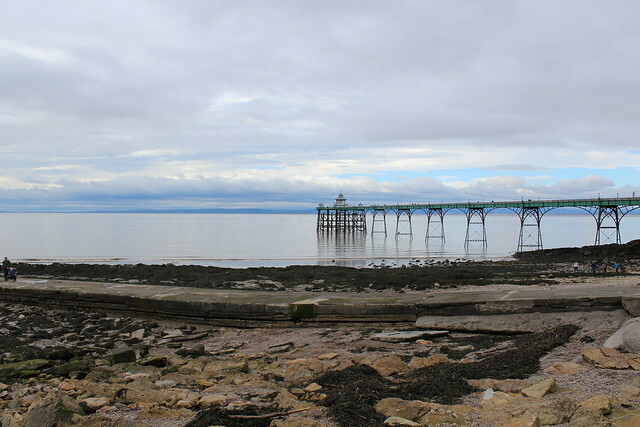 The little faded town of Clevedon is just south of Bristol, technically perhaps the estuary of the River Severn where it leads out to sea. But as we arrived the long awaited smell of salty sea, and that wide expanse of water with South Wales on the other side, the sea it surely was. 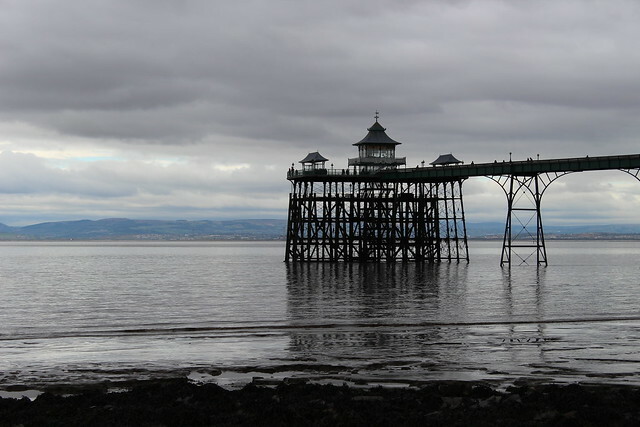 Clevedon still has it's beautiful Victorian pier. I think this really is the attraction. 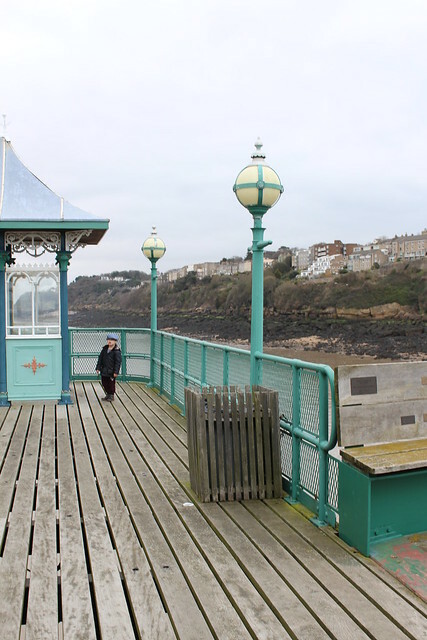 A walk along this truly vintage pier is the thing to do. The day was overcast, but the light and colours of the clouds and sea were just so amazing. I was in photographer heaven. It was all so beautifully calm, no breeze, or cool air. Just a quiet hush of clouds hovering over the sea. It was so tranquil. So Zen. Walking down the wooden planks you can see little memorial plaques embedded all the way along. Fishermen quietly set up their rods here. The pier feels almost almost Japanese in style here, with it's little tea room sitting at the end. Almost other wordly, sitting in the middle of the calm sea. The end of the pier was like being on a boat. In it's heyday I think paddle steamers would pick passengers for boat trips from here. The passengers would climb down the staircase inside the building and embark there. We had several conversations about climbing the Eiffel Tower and being on the Titanic. The pier felt very evocative of those things. Here's the little tea room in the, where you can sit inside and drink tea! We didn't do that this time, probably because I was trying negotiate the dog too. 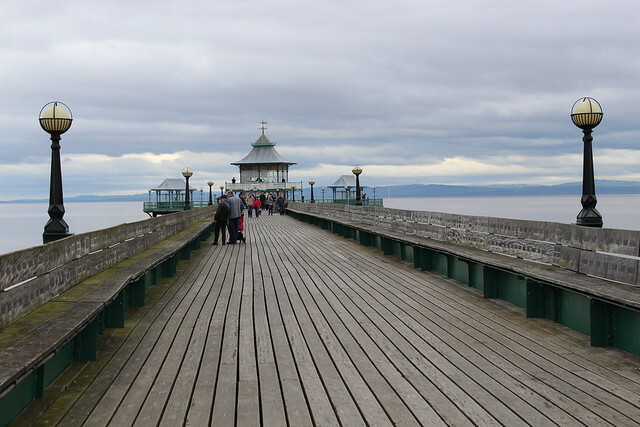 But I imagine on a more stormy day, if the pier is open, it must be quite a surreal retreat. After doing Susannah's course I noticed how when I was telling a story I wouldn't usually be in the pictures, so I thought I would put myself in this one. It's a bit cheesy. But then so is this. We tried to take a picture of us both here but the lady who helped us couldn't really work out my camera. But I did manage to get this one instead. I love the way he's looking at me and the dog is gazing out to sea! A very rare teenage photo. This was Harry the adventurer. And I know that because I watched him career around the pier and Clevedon, determinedly many paces ahead of his parents, who were incredibly relaxed about it too. There was a huge amount of trust operating here and my heart was slightly in my mouth. Interesting to see how differently people do things. 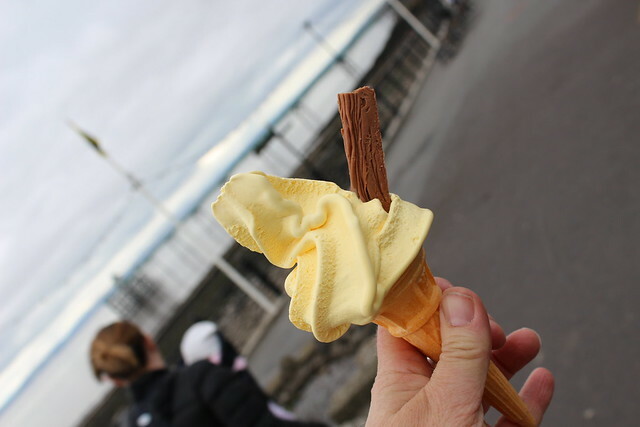 No visit to the seaside would be complete without an ice cream of course, This was me trying to juggle the camera and dog's lead. 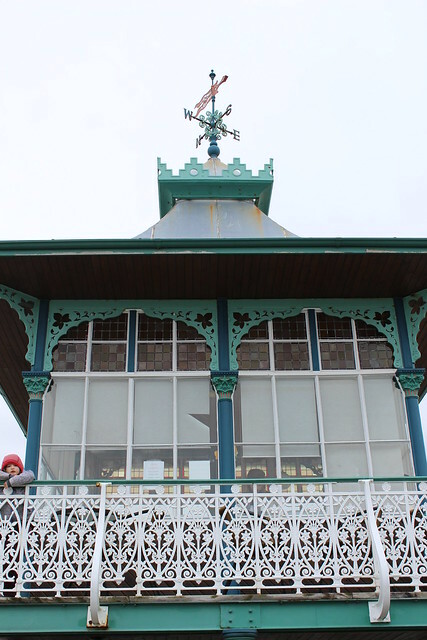 Who says you can't go to the seaside when it's cloudy! A very dramatic shot. The tide was out and we took a carefull walk down the slippery causeway. By the water we could hear the waves gentle lapping. It was so relaxing I felt almost drunk on the atmosphere. Back on the beach we searched through the pebble for treasure. 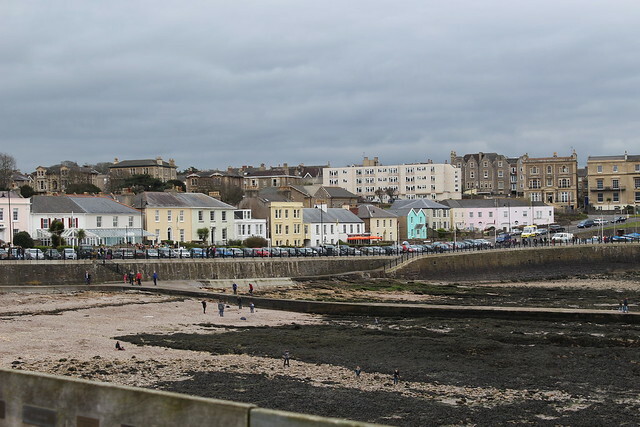 Further along the seafront wall there is an old-fashioned amusement arcade and a pub where we had little buckets of chips in the beer garden. No pictures of these to show! 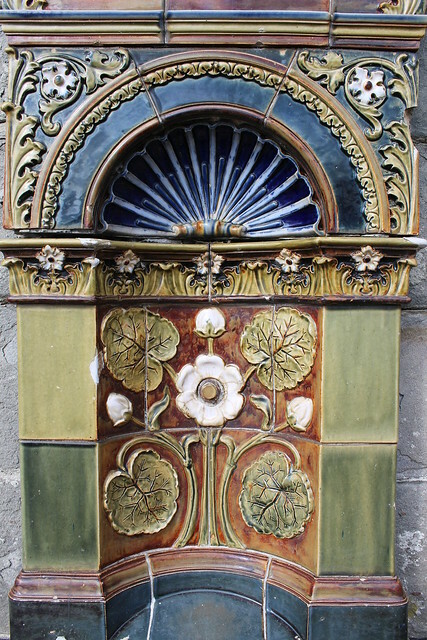 A beautiful Victorian drinking fountain by the pier. As we turned around to leave some blue sky began to emerge, which made for a lovely picture. I was so happy with these pictures. Just as they are. I haven't edited them at all, which for me is unusual. I just love the palate of colours here and light just as it was. And the fact I was on a family day out, finally. It was all just right. A new visitor center is being built at the beach end of the pier, which will open eventually and hold some amazing pictures of the history of the pier, and there are some quaint shops nearby, yet to be explored. I will definitely being going back. Until next time. What a wonderful day out, some beautiful photos. What a lovely outing, and your pictures are all wonderful! Well done you for getting such a great one of your teenage son. I don't think I have a single picture of my boys from that age where they aren't scowling. Your photos are lovely and that drinking fountain is amazing. I love your little doggie! Oh thankyou for these photos. I haven't been to the sea for some months and am experiencing withdrawal symptoms. 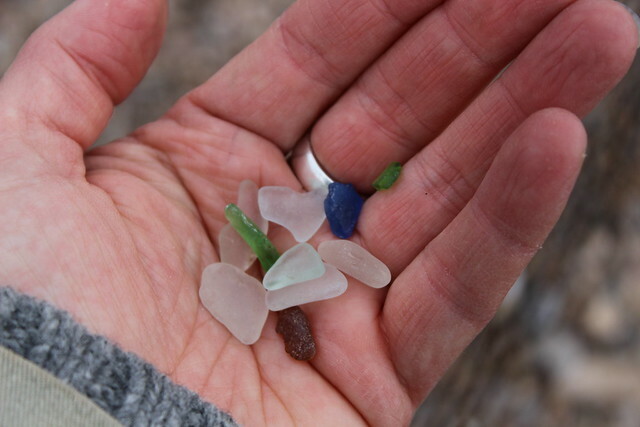 My eyes lit up at the sight of the blue seaglass in your hand there. Seaglass is a passion of mine. I use it to make jewellery. If you're ever in the Northeast Seaham is worth a pilgrimage. The pier was rebuilt using donations, each then received a plaque, there is one with our names on. The Balmoral still docks at the end of the pier, so it can be classed as a working pier. Hope you were able to have one of the huge cupcakes they sell with the coffee's. Lovely post. Having been bought up in Bristol, this is a place that has many special memories for me. You've captured its' faded beauty wonderfully. And how lovely to see you, and your rather handsome teen too! Heather, your photos are beautiful ! Especially liked the last one of the pier with the clouds! Your son is handsome and dog is cute! A very lovely family indeed! Glad you had family time. Oh and having a peek at Clifton Bridge, I would have gone around as well! 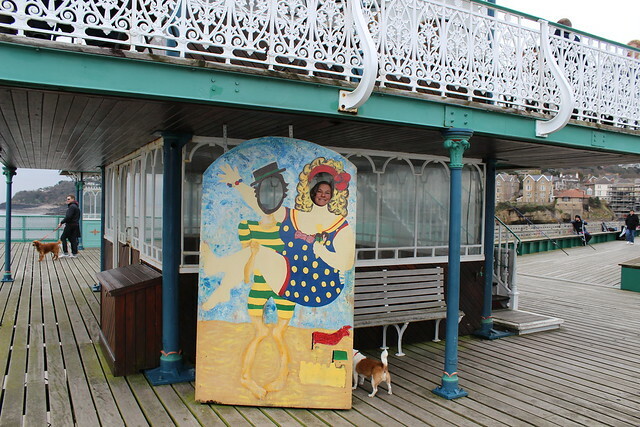 I love your day at the seaside pictures, especially the one of our son and dog. 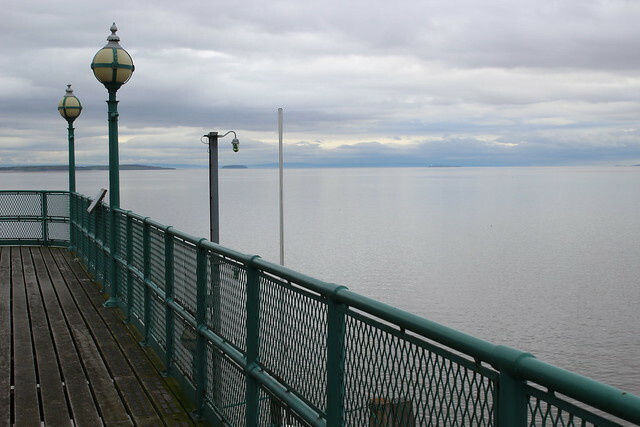 I've never been to Clevedon but it reminds me of Llandudno, another Victorian resort near here. Your outing looks chilly but cheery! The perfect way to spend some of the Easter weekend. I hope we can see pictures of this little village come summertime too. Hint, hint!